The first time I tried beetroot in a tart plum sauce was in Georgia, and I’ve loved this combination since. It’s sweet and sour, pleasantly bitter from chicory and a little spicy from the chilli. 1. Preheat the oven to 180˚C, gas mark 4. Pour the oil into a large roasting tin and heat in the oven for 5 minutes. Carefully toss the beetroot in the hot oil and sprinkle with flaky sea salt. Cook for 30 minutes, tossing from time to time. 2. 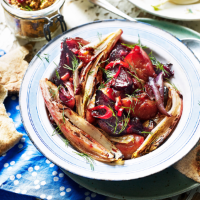 Add the plums, chilli, onion wedges, vinegar and honey and cook for another 15-20 minutes. Add the chicory for the last 5 minutes of roasting. When all the vegetables are soft and crispy at the edges, let them come to room temperature and serve with some chopped dill and coriander, if liked, or any other soft herbs you’ve got lurking in the fridge.